Posted at 11:57 am by Yummytums! Are you familiar with those cartons of Halos mandarin oranges that appear in grocery stores this time of year? The fruits are seedless and easy to peel and I love the taste. Unfortunately, I’m the only one in my house who eats them and since these things come in large packages, it can be a challenge to finish them before they go bad. 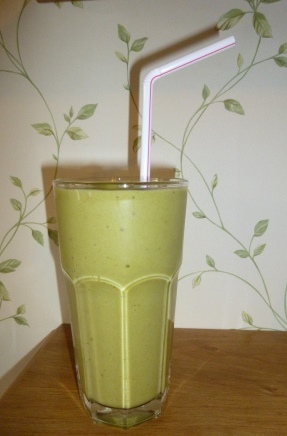 But I’ve found a great use for these sweet little fruits in this Orange Breakfast Green Smoothie recipe. This smoothie is high in potassium and vitamins A, B6, C and E. It also contains calcium, copper, folate and zinc. The taste? It’s sweet, creamy and orangey. Yes, it’s green, but the fruits definitely mask any green taste. I’m not a fan of grapefruit, which is one of the ingredients in this recipe. But the grapefruit taste is not evident; it just adds a little extra citrusy kick. I actually used a fruit cup of grapefruit (drained) rather than fresh and I used a frozen banana. You can certainly use fresh if you have it. Add the Swiss chard, oranges, grapefruit, avocado, banana and protein powder to a high-speed blender. Top with ice cubes and add water. Blend for 30 seconds or until you reach the consistency you desire.